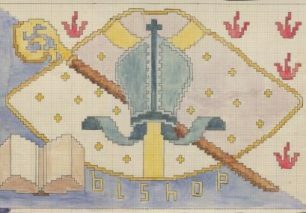 File contains correspondence and records relating to the commissioning of a set of Festal Vestments in 2003. Correspondence to and from Lady Maufe and The Wilton Royal Carpet Factory Ltd regarding the proposed kneelers for Guildford Cathedral. Correspondence concerns a small sample and the overall design of the kneelers. File contains correspondence with Warner & Sons Limited and Lady Maufe concerning the Dorsal curtain and how best to clean the curtain, also includes a fabric sample showing original condition. Correspondence to and from Lady Maufe and Edinburgh Weavers regarding proposals and designs for the choir cassocks, including the colours of the fabric and the texture of additional features, includes fabric samples. File contains correspondence with Portsmouth Cathedral regarding the proposed Lay Canons’ Gowns.